Good card games can be so simple: either take a card or pay a chip. Anyone can make that decision, right? However, there's a catch - in fact there are two. Nobody wants the cards, not even for free, because they give you points in a game where you need to have the fewest points to win. And the chips? They are scarce, very scarce! This is a good filler for 3 to 5 players that plays in around 10 to 20 minutes. 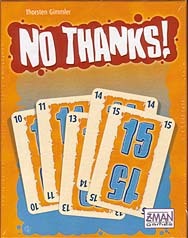 The game consists of a deck of 33 cards numbered 3 to 35 and 55 red chips. Before play, 9 cards are randomly removed from the deck and 11 chips are given to the players. The top card is turned over and the first player can either take the card or put a chip on it. The next player has the same choice. Taking a card lets you take the chips on it. Another card is revealed and this take a card or place a chip choice continues until all 24 cards are taken. Points are then scored. The cards in your hand are worth their face value minus the number of chips you have. Lowest score wins. An added twist is that if you have, say, 9, 10 & 11 in a sequence, only the lowest card counts. SImple to play, but how far do you push your luck? Remember that 9 cards are not in the deck, so you do not know how long a sequence you can build. This uncertainty keeps the game fun and tense.